They are using a combination of simulation modeling and queuing theory to achieve their goals. “Given the operational characteristics and performance thresholds, the model will optimize for the ‘best’ sustainment course of action for the commander’s consideration,” explained Fletcher. 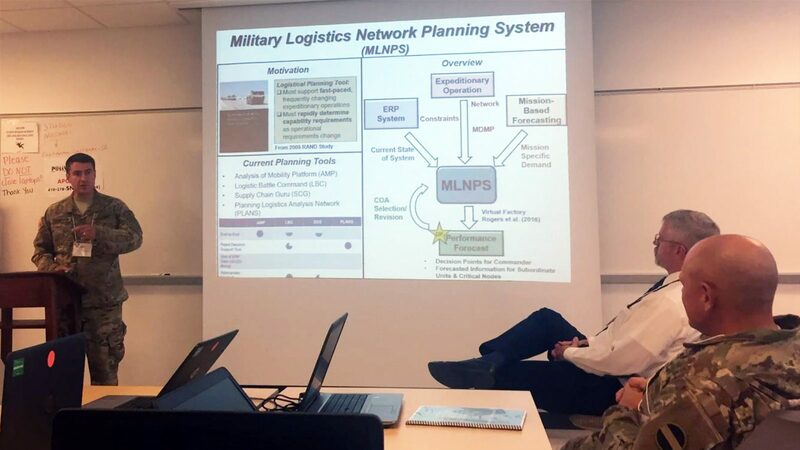 “Using our model, a planner could quickly assess different courses of action, providing a military commander a much better understanding of the sustainment impacts of the scheme of maneuver. No other extant logistics planning model exploits enterprise resource planning data or runs in near-real time.” This makes their model unique and relevant for operational planners. At the end of the symposium, Army Brigadier General Karl Gingrich spoke to representatives from the major Army analytic agencies. He stated that the Army should use universities that are leading in data and analysis techniques, such as NC State. “This looks like some validation that we are building our reputation,” exclaimed Fletcher. The good news is that among the attendees were members of West Point, an academy that does not offer graduate programs and will pay for students to pursue degrees elsewhere. After the endorsements given at the event, the OR Department hopes that West Point will suggest NC State as an option to their students.